Sewing | Do-It-Yourself Advice Blog. We’re excited to announce the upcoming release of our latest Ultrafeed model, the v.3. Coming this June the Ultrafeed will include several new drive parts and an updated look. This new machine is still the Ultrafeed that you know and love but with a few improvements. Here at Sailrite, we have a long history continually improving the Ultrafeed Sewing Machines to maintain their status as the best portable, heavy-duty sewing machine around. If you’re interested, you can read the full history of the evolution of the Ultrafeed in our article “The Ultrafeed Journey.” Because we’re always improving, even though we loved the v.2 machine, we knew that we could make it even better. This fine-tuning and optimization process is what led to the v.3 machine. The Ultrafeed v.3 has 3 basic new features: three of the drive parts have been re-designed, the feed components are improved, and the PLUS and PREMIUM packages come in a new Industrial Carrying Case. So what do all these changes mean? Let’s break them down and take a closer look. For the v.3, we re-designed three of the drive components: the motor bracket, jack drive and the motor pulley. All of these parts have been optimized to create less friction and to be better aligned for smoother operation. This also results in less noise while sewing and less wear on the parts, increasing their longevity. These updated parts are actually not unique to the v.3 Ultrafeed, but rather have been phased into our v.2 machines starting in 2016. So if you bought your machine during the first half of 2016, you may already have these parts. We have made improvements to the feeding mechanism to make it last longer and grip even better than before. Unlike other sewing machines with knurled feeding mechanisms, the Ultrafeed has sharp teeth to grip and evenly feed your material through the machine. Our new carrying case come standard with all Plus and Premium Ultrafeed packages and can be purchased separately if you want to upgrade your existing Ultrafeed. The new case features a specially padded lid to support and protect your machine, even when stored on its side. The Sailrite logo is silkscreened on the case lid and serves as an easy guide to remember which way the lid fits and which direction to set the machine for sewing. Other new features include extra-large rubber feet to keep the case in place while sewing, and heavy-duty butterfly latches securing the case lid. The Ultrafeed v.3 machines will continue to be tuned and finished in our Indiana facility and will offer all the power, performance and quality you’ve come to expect from Sailrite. Look for the Ultrafeed v.3 Sewing Machines at Sailrite.com starting in June 2016. Lifetime threads are more expensive than traditional polyester thread, but for projects that will be outdoors all the time, a lifetime thread is well worth the extra investment. Sailrite stocks two brands of lifetime thread, Profilen and Tenara, and today we’re going to break down the strengths of each so you can decide which will work best for you. First, let’s go over what all lifetime threads have in common. They all carry a lifetime guarantee (hence the name) and are unaffected by exposure to UV rays, harsh cleaning agents, pollution, saltwater, rain, snow, cold and rot. These threads can be left outside all year round in all of the elements and they still will outlast the fabric they are sewn into! All 5 colors of Tenara Thread. Tenara Thread, by Gore, is the original lifetime thread and is made of a unique fluoropolymer fiber construction. It is available in five colors on 8 oz. cones and comes in two sizes: regular, which is similar to a V-92 thread, and heavyweight, which is similar to a V-138 thread. Tenara thread is lubricated with a very small amount of silicone wax. This wax finish helps to provide lubrication during the sewing process. This extra lubrication can make the thread tricky to sew in some sewing machines, but is ideal for use with rotary hook sewing machines. In a rotary hook machine, the wax lubricates the machine too, and helps to create excellent stitch quality with very low stretch. We recommend Tenara thread for use with rotary hook sewing machines like the Sailrite 111, the Sailrite Professional Series and the Sailrite Big-N-Tall. Profilen Thread in both colors and cone sizes. Profilen thread is made of polytetrafluoroethylene (PTFE) and also features properties that repel dirt and water and it is self-cleaning. Profilen is available in two colors on 4 oz. or 8 oz. cones and the thread size is comparable to a V-92 thread. Profilen thread is softer than other lifetime threads, which makes it easier to sew properly. We highly recommend Profilen thread for use in oscillating hook sewing machines like the Sailrite Ultrafeed. If you’re not sure if your sewing machine has an oscillating or rotary hook, our Rotary vs. Oscillating Hook Sewing Machines blog post outlines how each type of machine works and tells you how to tell which type of machine you have. All in all, you cannot make a wrong choice with lifetime threads, but selecting the one that will sew best in your sewing machine will give you an easier sewing experience. You can find both of these lifetime threads at Sailrite.com. Add eye-catching top stitches to your boat and auto upholstery with a French seam. Taking the time to sew a French seam not only adds visual interest to your upholstery but it also strengthens the seam. We’ll show you how to get this look for yourself in a quick video tutorial. The French seam demonstrated in our video is also known as a “double top stitch” and is commonly found in applications using leather, faux leather or vinyl. When sewing lighter materials for apparel and some home goods applications, the term “French seam” refers to a slightly different technique. When sewing a French seam for your upholstery, we recommend adding a backing material behind the first seam. This way, if the seam is stretched when the seat is in use, the backing fabric blocks the lining under the fabric from being seen, while also adding additional strength. To get the best appearance on your top stitch, we also recommend using a heavier weight thread so it will have a thicker appearance. You can also sew with a contrasting thread color so the stitching will pop against your fabric. Find all the materials to sew your own boat or auto upholstery at Sailrite.com. These French seams will be featured in a boat cushion video out later this year. Be sure to subscribe to the blog so you don’t miss a post! What is the UY 128 GAS Needle? We recently added a new needle system for our Sailrite Professional Sewing Machine Series. The UY 128 GAS is a needle system that features an extra long scarf. 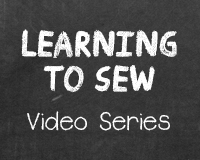 Let’s take a closer look at what this means and how it can improve your sewing. UY 128 GAS is the needle system for this new set of needles. The needle system refers to which needles fit in which sewing machines. The needle system is determined by the diameter of the needle’s shank and the needle’s length from the very top of the needle to the top of the eye. On the UY 128 GAS needles, as with most needles for industrial sewing machines, the shank is completely round. In this case, what sets the UY 128 GAS needles apart from other systems is their long scarf. The scarf is the indentation above the needle’s eye that allows the thread to be grabbed by the shuttle hook under the throat plate to create a stitch. Longer scarves can help to eliminate skipped stitches. The Professional Sewing Machines have a very wide zigzag stitch and this can be problematic with some smaller scarfed needles. The taller scarf increases the tolerance on the right side of the stitch for the hook to catch the thread loop properly. It also reduces possible interference between the needle’s body and the hook or thread when the stitch width is at it’s widest. All of the UY 128 GAS needles stocked by Sailrite are general purpose, round point needles so they will work well for a wide variety of sewing projects. We’re excited about the ease of use with these needles and the wide zigzag stitches the Professional machines will easily produce when these needles are used. Sailrite is now recommending the UY 128 GAS needles as the standard needle system for all Sailrite Professional Sewing Machines. Try these needles out for yourself. See our full selection of sizes at Sailrite.com. To learn more about sewing machines needles, head over to our Anatomy of a Sewing Machine Needle post. You can also read more about how your sewing machines creates a stitch in our How a Sewing Machine Works post. Whether your shopping for a new sewing machine or just looking to better understand the one you have, it can be helpful to understand the differences in features and functionality between machines. One feature that plays a key role in how your sewing machine works is the hook system. This is the part of the machine that catches the thread as it is forced out of the needle to create a stitch. There are two main types of hooks, rotary and oscillating. Both hooks create lockstitch stitches, but they work differently and have a couple different considerations. Let’s take a closer look at these two systems. Rotary Hook in the Sailrite Big-N-Tall. Shown without the bobbin. A rotary hook machine, sometimes called a full rotary machine, is a machine in which the hook rotates in a full circle around a stationary bobbin. In this system, the shuttle hook catches the thread when the needle is going back up through the fabric and the hook then carries the thread around the bobbin cage to form the stitch, going all the way around the bobbin. Rotary machines use a gear or timing belt linkage between the top and bottom shafts of the machine. To keep this function working properly, it must be set very precisely. This need for precision means that rotary hook sewing machines have tight thread tolerances. In other words, they work well with threads of specific, recommended sizes but can be unforgiving outside of their range. Additionally, small rotary hook machines tend to need their timing adjusted more frequently to maintain that precision. A sewing machine with a rotary hook runs smoother at higher speeds (no vibrating), is quieter and has less frequent thread jams than machines with oscillating hooks. However, these machines are usually more expensive than oscillating hook machines. Rotary hooks are the standard choice for industrial sewing machines. The Sailrite 111, the Sailrite Professional Series and the Sailrite Big-N-Tall are all full-sized, industrial machines with rotary hooks. Oscillating hook shown without the bobbin in the Ultrafeed LSZ-1. Oscillating hook sewing machines have a hook that, instead of rotating in a full circle, oscillates back and forth. In this system, the hook picks up the upper thread from the needle and carries it down around the bottom of the bobbin cage. Once it has done this, the hook reverses its direction and returns to its original location. Oscillating hook sewing machines have simpler mechanics and tend to be more affordable than rotary hook machines. They are also easier to time and maintain. Since oscillating hook machines have looser tolerances than the precise rotary hooks, oscillating hook machines can sew heavier threads in smaller machines. The drawbacks to oscillating hook machines are that they are louder and are generally not as fast. Both the Sailrite Ultrafeed LS-1 and LSZ-1 Sewing Machines have oscillating hooks. Which Machine Do I Have? If you’re looking at purchasing a new machine, the shuttle type is often listed in the machine’s specifications. If you’re unsure what type of hook your current machine has, there’s a simple way to tell. Remove the bobbin from your machine and turn the balance wheel by hand. Watch the motion of the hook. Does it make a full circle or does it change directions? If it changes direction, it’s an oscillating hook and if it stays on a full circular pattern it’s a rotary hook. In general, oscillating hook machines offer more versatility with their looser thread tolerances. We find that they tend to be easier for amateurs to use because they are more forgiving to use and are easier to maintain because they require fewer adjustments. However, both types of machines will give you excellent stitches and performance. For many, the choice is preferential or driven by necessary features. To learn more about the features of Sailrite’s rotary and oscillating hook sewing machines visit Sailrite.com. Do you use pre-wound bobbins in your sewing? These fully loaded bobbins can be a great benefit when sewing—keeping you sewing longer and making the transition between bobbins much faster. We’re going to take a closer look at the different pre-wound bobbin options so you can start enjoying the benefits of sewing with them. You may have heard pre-wound bobbins being referred to as belbobs, barbobs or hembobs. These little bobbins have many names, but in general these terms refer to the same thing. Each thread company over time has branded their own name for their pre-wound bobbins. Belbobs, for example, were from the Belding Corticelli Thread Company. These are sideless bobbins with a core. Barbobs came from Barbour Threads and are bobbins with a core and paper sides. A hembob came from the Hemmingway Bartlett Thread Company and is a sideless, coreless bobbin. Through company mergers over the years, none of these original companies are still in existence today and the terms are now used interchangeably. You’ll see on the Sailrite website that we generically refer to all pre-wound bobbins generically as “hembobs.” We do this because we originally sold only hembobs from Hemmingway Barlett. After that company was bought out, we don’t actually carry any true hembobs anymore (without a core or sides) but we kept the name hembob because our customers were familiar with that term over the other synonyms for pre-wound bobbins. Why use a pre-wound bobbin over one you wind yourself? The main benefits to using a pre-wound bobbin are that hembobs are easier for the sewist and create better stitches. One main difference between pre-wound bobbins and those you wind yourself is that a pre-wound bobbin can hold 30-50% more thread than an own-wound bobbin. This extra thread leads to fewer bobbin changes while sewing. Also, because the thread is wound on the bobbin at the factory there is more consistency with how much thread is on each bobbin. This will help you better anticipate when the thread will run out. Factory wound bobbins create better stitches because the wind is more consistent than on self-wound bobbins. This, in turn, makes the tension of the thread more consistent as it comes off the bobbin, which improves the stitch appearance and the bobbin tension. The soft sides of pre-wound bobbins also reduce the risk of the thread breaking if there are rough edges on a metal bobbin. Arguably the biggest reason to use a pre-wound bobbin is that it is just easier. You don’t need to worry about winding a bobbin before threading your machine during set-up for a project so it saves you time. Pre-wound bobbins can also save you money because you won’t need to buy a stash of empty metal bobbins. When you go to purchase a pre-wound bobbin of thread, you’ll see that there are different “styles” to choose from. Style is a guide for the diameter and height of a bobbin as expressed through a letter designation. Common bobbin sizes include Style A, Style L and Style M, for example. You can find which style will fit your sewing machine in the machine’s guidebook. Sailrite also lists common sewing machines that each bobbin will fit in. The Ultrafeed Sewing Machines use a Style A (also known as Type 15) bobbin. Hopefully you learned something new about pre-wound bobbins. If you want to give them a try for yourself, you can get white or black bobbins for all Sailrite sewing machines at Sailrite.com. Do you sew with pre-wound bobbins? What do you like or dislike about them? Share your experiences in the comments!